This Valentine’s Day went pretty well. I was very pleased that Kit and I decided to stay at home. I hate the stress of going out for a fancy dinner only to find every restaurant over-packed with other noisy people. Besides our food was better. First, we got semi-dressed up and were witnesses at a friend’s wedding. We had lunch with the happy couple and then went trudging to do the V-day shopping we should have done days before. I was surprised how many men were snatching flowers with a desperate look in their eyes and how many folk there were in the grocery store. This is a hugely popular DIY gift on Pinterest. The project is called 52 Things I Love About You. On each card I wrote something that I love about Kit. I copied some from another crafter, but I found that the ones that meant more were the personal ones. My Kit rarely wears pants. He is a shorts-man. Because of that fact I wanted him to wear shorts for our wedding. 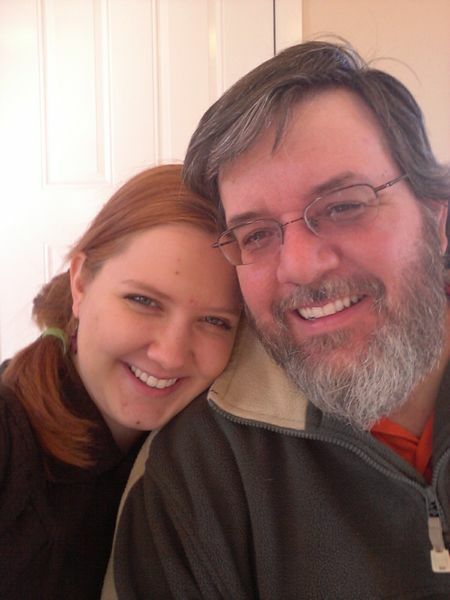 The phrase “Two Wild Banshees” is one of those things I catch him saying all the time. 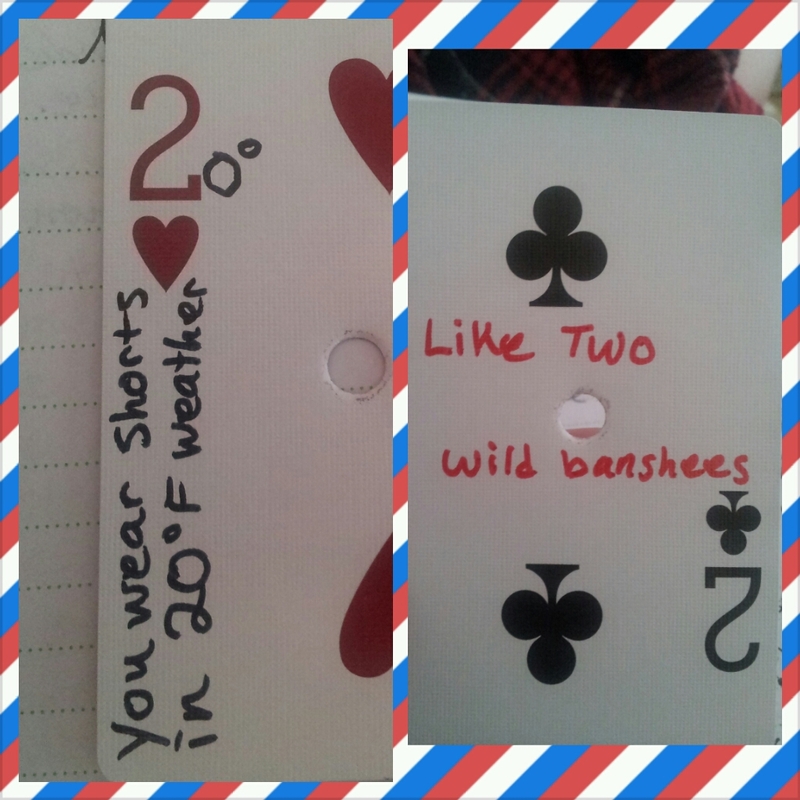 When Kit looked through the cards on Vday, he was chuckling and smiling all the way through. 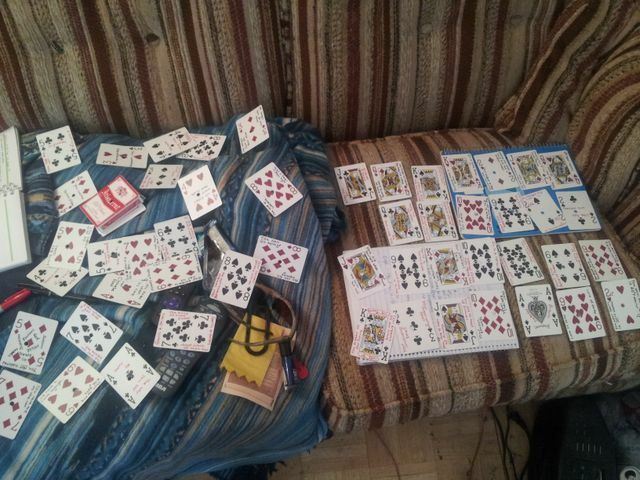 Because I wrote on the face of the cards, they can still be played with normally. Supper started the only way it could; with wine. 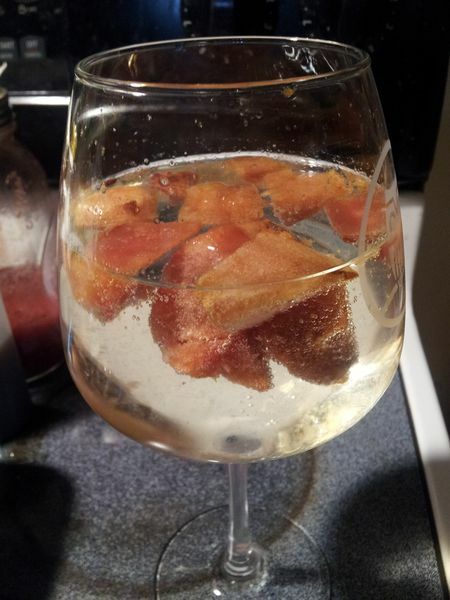 I bought a bottle of the same wine we had for our wedding (a peach chardonnay) and threw some frozen peaches into it. Perfecto. As you can see in the photo above, I skewered quartered small sweet onions, whole mushrooms (baby portabellas were on sale), whole grape tomatoes, and fat slices of red and green bell peppers. I baked these kabobs on a cookie sheet (I recommend putting aluminum foil on the trays to help with cleanup). Bake them for 10-12 minutes at 450F, flip them over and bake an additional 7-8 minutes. 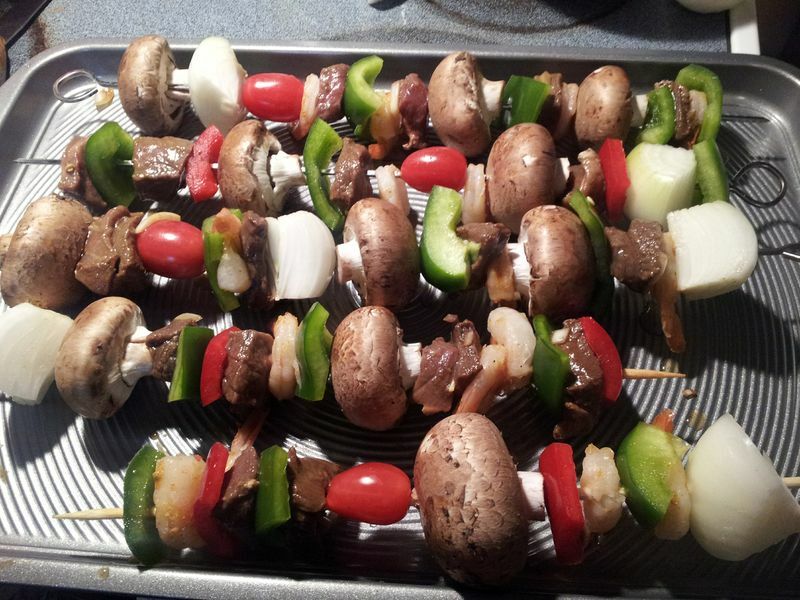 Thanks for the oven kabobs recipe, Sarra! 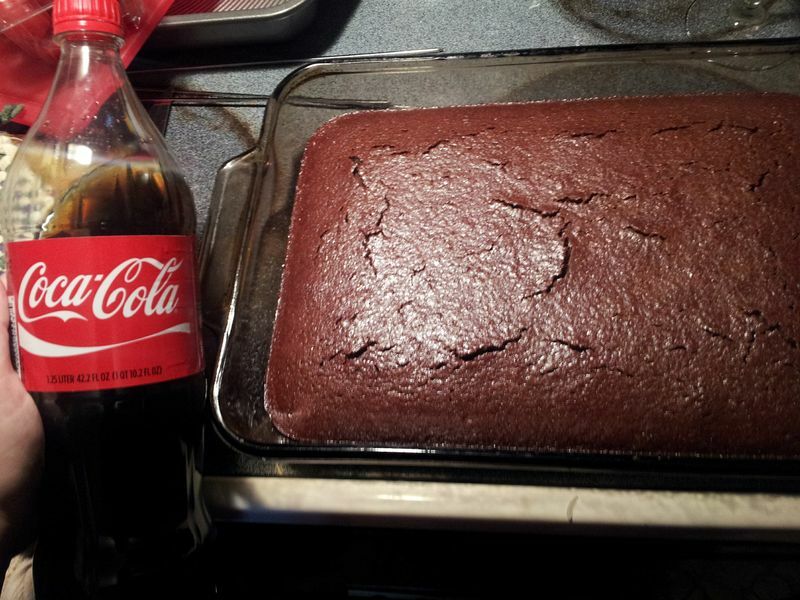 I made coca-cola cake for dessert. I failed to check my stock of butter and only had enough to make the cake and not the glaze that went on top. What makes coca-cola cake special or different from a regular chocolate cake? I honestly have no clue. Google is not helping a sister out either. It was a good recipe that I have to try again when I can do the glaze as well. I honestly love my mom’s recipe for crazy cake. This was more moist…almost like a light brownie. The rest of the evening was spent enjoying our present that we gave to each other. Our Roku is so much better than jewelry I may never wear. Tons of Netflix TV shows at our fingertips. In one month, the Roku has already paid for itself several times over because we were frequent users of Redbox.